"Keep watch over yourselves and the entire flock of which the Holy Spirit has made you bishops. Be shepherds of the Church of God, which He purchased with His own blood. I know that after my departure, savage wolves will come in among you and will not spare the flock. Even from your own number, men will rise up and distort the truth to draw away disciples after them" (Acts 20:28-30). He says that savage wolves in sheeps clothing will emerge, and try to cut off the faithful from the Church. And we unfortunately will easily leave, because we are egotistical. How can we be sure of something? What guarantees is first the Bishop and after the Synod of Bishops. And because now the Pan-Orthodox Synod will take place, many ask why? Many who do not fear God have made Christians dizzy with many and various things. Who will tell us the truth? The Holy Synod of the Church of Greece. No one is above it. And what the Holy Synod said, you heard last Sunday. 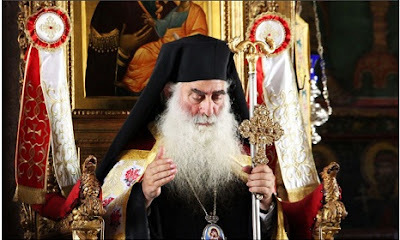 The Church decided, all the Bishops, all without exception, and don't let anyone fool you, because in the Holy Synod of Hierarchs no one essentially disagreed, which is why our Church will be at the Pan-Orthodox Synod. Everyone made their views known, adopted its proposals, and will go to the Synod, which is the preeminent expression of ecclesiastical life. Why? Because what oversees every Synod is the Holy Spirit. To refuse to go is like thinking I am superior to the Holy Spirit. This is what it essentially means. So then, who will we listen to? The Church and only her. No one else. Even if it is the most pious and holiest person. As long as the Church in Synod (this is how the Church lives) has decided to participate and accepted its proposals, everyone who denies them leaves the Church. This is the reality. Because essentially many of us want to put ourselves above the Church. But this is a demonic delusion. This is how the First Ecumenical Synod met. To face problems. At that time it was Arius as well as other problems. And it was to put things in order. This is what the Standing Holy Synod of the Church of Greece and the Synod of Hierarchs of our Church as well as every Church does, which is the supreme organ of the Church. And before we begin, we always ask that the grace of the Holy Spirit will come and illumine us. So, then, it is important to be careful, that you will not be misled. For "your adversary the devil prowls around like a roaring lion, seeking someone to devour" (1 Pet. 5:8), in other words, who he will manage to cut off from the Church. The true Orthodox believer says: "It has been said by the Church. So it is. I do not have any other opinion." And indeed there is a great principle which says: "Let the opinion of the majority prevail" (Canon 6, First Ecumenical Synod). In other words, the opinion of the many will prevail. Therefore, each of us will not decide. Each of us does not lift up a banner, but we make decisions together and are persuaded, even if we perhaps do not agree. You will say too, why would we not agree? Because we may be in error. Therefore, great care is needed. This is why we honor the Fathers today, because they were spiritual guides in the era in which they lived. Today we see them in an icon, but at one time they were alive. They walked, they met, they disagreed, and this is why they held discussions. The Apostolic Synod of the Twelve Apostles met, because the Apostle Peter had a disagreement with the Apostle Paul, and the Synod concluded and was accepted by the entire Church. This is what freedom, love and life mean. This is what the Church is. Which is why, therefore, we must be careful. This is what the Church always tells us.